Since the 1960's, Paik, a pioneer of video art, has always been in the forefront of that genre together with numerous performances. 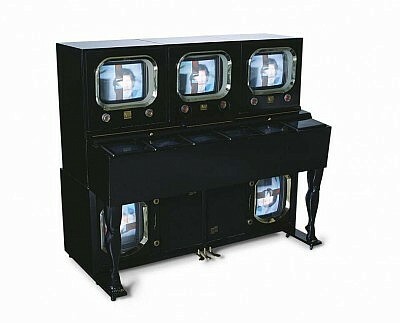 This particular work is made from a wooden TV cabinet and a classical piano frame from the 1950's, which were already considered old models at the time it was created. Yet, the pictures (videos) are novel and beautiful. Close scrutiny of the work reveals the contrast of the old and new behind it. Paik, who started out as a musician, seems to ridicule himself by giving the work such a humorous title.